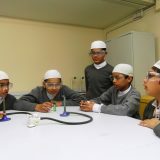 The aim of the curriculum is to give all pupils a broad, balanced and relevant education within an Islamic framework. This will be achieved through a structured learning experience, matched with the personal development and abilities of each individual. The learning process will not only promote spiritual, moral, cultural, mental and physical development of the pupils, but will also prepare them for the future opportunities, responsibilities and experiences of adult life. The school has an extensive collection of fiction and non-fiction books, including classics and bestsellers as well as a large collection of research materials. The Mathematics Department aims to develop the pupils’ ability to understand Mathematics and to study all aspects required by the National Curriculum. Pupils are expected to have reached Attainment Level 8 of the National Curriculum. Pupils will continue to progress through the course, concentrating on the GCSE examination. The primary aim of the Science Department is to provide a broad basis of scientific knowledge for all pupils. Furthermore we provide a more specialised science course specifically for those who wish to continue their studies in Further Education or pursue careers in Science, such as Pharmacy, Dentistry, Medicine and Engineering. Science is all about curiosity, healthy scepticism and a critical evaluation of their experiments in our well-equipped laboratory to attain scientific knowledge and develop practical skills in a safe and secure environment. Follow a foundation course during which they acquire scientific knowledge and develop practical skills in a safe secure environment. Follow a GCSE Double Award Course (2 GCSEs in Science) covering aspects of Biology, Chemistry and Physics. Extra lessons are arranged for GCSE candidates and those needing extra support in their examination preparation. The overall aim of the English programme is to provide a learning environment in which pupils can improve their skills in reading, writing, speaking and listening. Follow a course which covers all aspects of the National Curriculum, including grammar, spelling, punctuation and vocabulary-building, all of which are taught in the context of real literacy and non-literacy discourses. Follow a dual certification course in English Language and Literature, leading to two separate GCSE examinations. In this modern age it is very important to be computer literate, and computer literacy is highly valued in the society. At the school we aim to provide the facilities to make our pupils competent users of information processors. Our commitment is coupled with the fact that we have the latest hardware, software and operating systems. Information & Communication Technology is taught according to the National Curriculum. In ICT they will be working towards gaining the European Computer Driving Licence (ECDL). 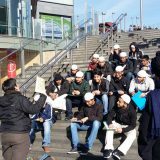 Islamic studies has a central role to play in managing the personal, social, academic, religious and spiritual aspects of the pupils’ lives. It enhances pupil’s Islamic values and thereby helps them to put the Islamic way of life into practice as commanded by Allah Tala in The Holy Qur’an and indicated by the Prophet Muhammad’s (SAW) Sunnah. Continue to enhance their understanding, as well as revising in greater depth the subjects already covered at Key Stage 3. This will help them partially in their preparation for the GCSE examination in RE. In my time in Darul Hadis Latifiah, I always felt a sense of brotherhood between students. This feeling ensured that studying could be done in a safe environment and so everyone gave 100%, students and teachers alike. I found that the Madrasah helped develop my interest in a wide range of subjects, from Arabic and Islamic Studies to Mathematics and English. This development and interest came from the fact that the Madrasah boasts an excellent teaching staff, and due to this fact I achieved very good grades for my GCSE’s. 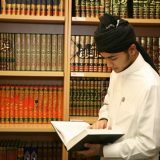 Darul Hadis Latifiah has all the facilities required for both the National Curriculum and Islamic Studies and is a great place to attain knowledge in both fields. Darul Hadis Latifiah is an excellent place to study. This institution has made me into what I am now. It has transformed my life into something what I have always desired for. This Madrasah has helped me into becoming a much more intelligent person. Alhamdulillah by the grace of Allah ta’ala and the support and the Dua of my teachers I have completed my Qirat, ‘Aalim and Hifz Course. The reference from the school also helped me to obtain a place in Al-Azhar University in Egypt and also Cambridge University where I completed a 4 month Shariah Course. I was honoured to be taught by the top professors of both Universities. Yet again this is due to all the support and the help from my teachers. I would like to thank Darul Hadis Latifiah for everything and the great platform they provided for me. I certainly will miss my time at Darul Hadis Latifiah. Darul Hadis Latifiah is a brilliant place to study. What I found most impressive was the excellent provisions for the parallel curriculums of the Islamic sciences and the mainstream subjects. This gave us the best of both worlds, with outstanding and engaging teaching on both sides. Our teachers constantly reminded us of the importance of seeking knowledge and advised us to pursue knowledge as far as we can, and this is a piece of advice I have always tried to hold on to. I am ever grateful for the opportunities I was given at the Madrasah. Again, Darul Hadis Latifiah is a brilliant place to study and I would recommend it to everyone. I completed my Alim course at Darul Hadis Latifiah which I found both academically and spiritually illuminating. The teachers were superb and offered great insight into the topics that we covered. My language studies especially Arabic and Urdu have come on leaps and bounds. Following the completion of my GCSE’s and Alim course, the school then offered great support and assistance to me as I filed a private application to University. The references and input of the school resulted in me obtaining a place at Kings College University and to study Religion, Philosophy and Ethics. In some ways I am sad that this era of my academic life has ended, I shall thoroughly miss coming back to Darul Hadis Latifiah on a regular level. The stimulating and diverse environment has set me up for a potentially successful career in Comparative Religion.